As I announced recently, I’m partnering with global market analysis firm Edison Research on The Social Habit, a comprehensive, quarterly study of how Americans use social media, why, and to what end. The Social Habit pre-orders now available. Edison (who is the exclusive provider of exit polling data for Presidential elections, among other things) is handling the research, and is using a rigorously controlled, randomly sampled panel of 3,000 Americans to produce The Social Habit. I’ll be helping with context, promotion, and interpretation of the findings along with Jason Falls and Mark Schaefer. We had nearly 100 submissions to the contest we launched last week, asking for important social media questions that remain (heretofore) unanswered. We selected three winners, whose questions will be incorporated into the Social Habit research. Susan Baier, Rhonda Hurwitz, and Steve Dodd will each receive a free copy of the research (which is now available on pre-order for just $297). I was especially interested in Steve’s question, because I ponder it a lot myself, and regularly get asked variations of it by our consulting clients. Also, Steve is a revenue consultant for early-stage technology companies, and a trustworthy Canadian. When people research products and services they want to buy, where do they look? Facebook, Twitter (or other similar properties), blogs, user forums, reviews, [and/or] company websites? I asked Steve to elaborate on why the impact of social media on research and purchase behavior is such an important data point to include in The Social Habit. Steve Dodd: Basically, I suspect the social monitoring, analytics and advertising spaces are focused on the big social networks like Twitter and Facebook, and because of that miss so much of the real commercial value of the deeper social web where people go to make purchasing decisions. There are millions of specialty sites out there where people share information about specific products and topics of interest. People search for these sites to get “real” insights into whatever it is they happen to be thinking about at any point in time. These might be the places where brands can have the most impact over time, rather than Twitter and Facebook. It’s fundamental direct marketing. Be at the right place at the right time. When/where is that? When a potential buyer is at a decision point. This is a topic I’m very, very passionate about. Terrific question and perspective from Steve, and we’re going to find out whether he’s correct in the assumption that brands are putting too much stock into the Big Two of social networks, and not enough stock into the deeper/broader social web. 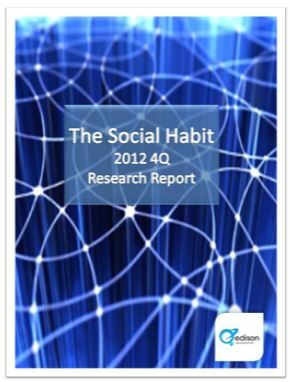 (download the most recent version of The Social Habit for free here). Subscribers receive exclusive access to the results – they will not be published publicly. It’s just $297 for the next two weeks. We’ve priced it reasonably so that businesses of all sizes can afford it. Perhaps most interestingly, companies can work with us to insert custom questions (like Steve’s) into The Social Habit survey. For example, if you wanted to know whether Pinterest users are disproportionately frequent travelers, and to which states, and at which hotel chains, etc. we can produce that information in a statistically sound fashion for you. Custom questions like that are $1997, which is many thousands of dollars less than custom research typically costs. Of course, there’s a limited number available, so if you’re interested let us know ASAP please. Here’s all the details on The Social Habit pricing and ordering. Also, we just published a FAQ about The Social Habit on the website, if you’re interested in the mechanics. Thanks for your support of solid social media research! And congrats to Steve, Susan, and Rhonda for their victory.